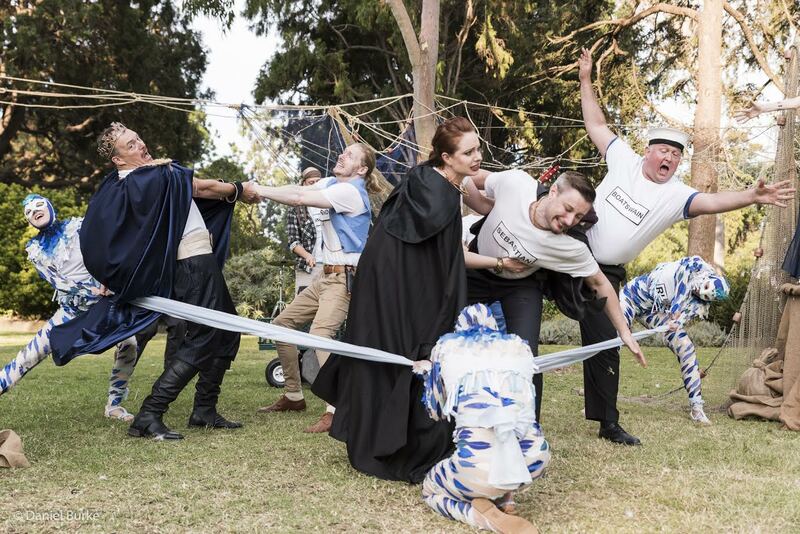 Jennifer Sarah Dean’s The Tempest is a fast-paced, energetic blend of contemporary humour and the renaissance that the Melbourne Shakespeare Company has already made their trademark as it comes to life in the beautiful backdrop of the St Kilda Botanical Gardens. The play follows the banished duke Prospero, where after twelve years on a mystical island her daughter Miranda has grown curious and she herself has become a powerful sorceress. Now, aided by her magical servants Ariel and Caliban, she calls on her magic one final time when the ship containing both her treacherous sister and her loyal allies meets the island, leading to a story with the hijinks and humour of a comedy but the mystery and magic of a fairy tale. With the production’s huge variety of talented female performers in roles varying from a powerful sorcerer, a love-sick daughter, a comic sailor drunk with power, a scheming trickster and mythical helper, it is difficult to believe the original play contained only a single female role. Emma Louise Pursey leads as the sorcerer Prospero with a regal composure that appears otherworldly amongst the chaos around her as she takes control of the storm. Yet she also shows a softer, more protective and even humourous side in regards to her daughter’s emerging love life. Jessica Tanner and Andrew Iles are hilarious as the gleefully conniving pair Antonio and Sebastian, with a playful cowardice that makes them endearing even in the midst of their plotting. 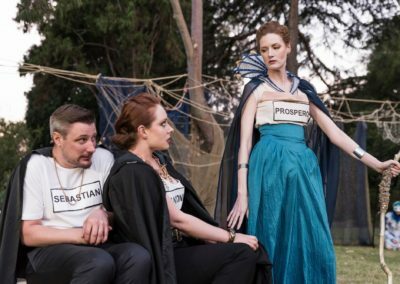 And with interpretations of how to create the magical sprite Ariel varying drastically across different productions, and Melbourne Shakespeare Company offers a unique and extremely effective take, with three actors sharing the role. Combined with Camilla Cream’s choreography, Madeline Dunkley, Victoria Mantynen and Lara Vocisani make a haunting group as they fill the park with an eerie, synchronised hum almost reminiscent of the Weird Sisters of Macbeth. With characters wondrously commenting on the strange music that fills the island, The Tempest lays the groundwork for music to be easily incorporated into the performance without breaking the illusion. Ben Adam’s medley of contemporary songs scattered throughout the play creates a powerful bond between the audience and the entire ensemble long before the first line of the script is even spoken. It allows the rapid romance between Carly Ellis’ Miranda and Charlie Sturgeon’s Ferdinand to be fleshed out, turning haste into something magical and surreal. 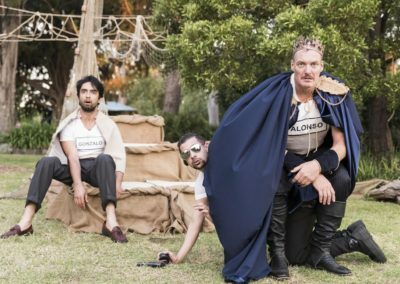 May Jasper, Johnathan Peck and Mitch Ralston work seamlessly together in a meld of fantastic physical comedy and some hysterically fitting updates as Stephano and Trinculo win Caliban over with goon “sack,” and John Reed is hilarious as the deadpan yet eccentric bodyguard Adrian. Rhiannon Irving’s design makes the most of their parkland stage, with the trees being draped with rigging and netting to transport both the characters and the audience to another world. The use of props is also innovative, with a chain of fabric setting the stage for the opening storm. The simple costumes for many of the cast with the names of the characters makes the rapidly paced adaptation easier to follow. But its greatest strength comes in separating the crew from the island’s mystical inhabitants. Richly decorated and interwoven with netting, they appear almost a part of the set and by extension their surreal, alien world. The triple cast Ariel takes this even further, prowling through the trees masked and adorned in feathers as a figure that is both wild and delicate. 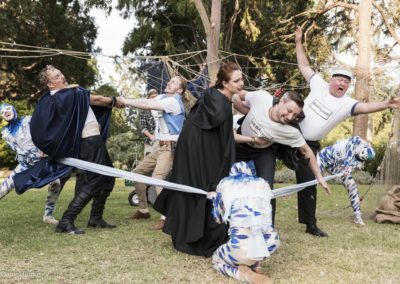 Melbourne Shakespeare Company’s lively interpretation sparkles with music and magic and sets the stage for a fantastic evening for the whole family. Click here for The Tempest performance dates, ticketing prices and more information. 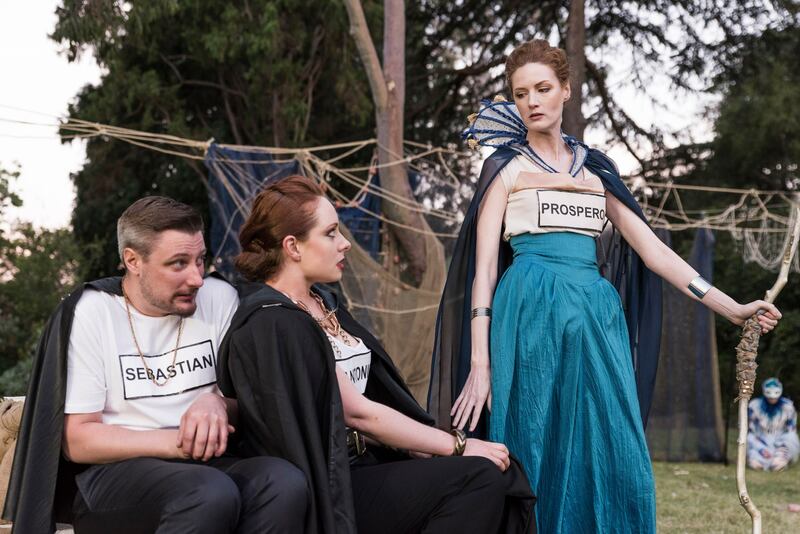 Andrew Iles as Sebastian, Jessica Tanner as Antonio and Emma Louise Pursey as Prospero.By Burke Photography. 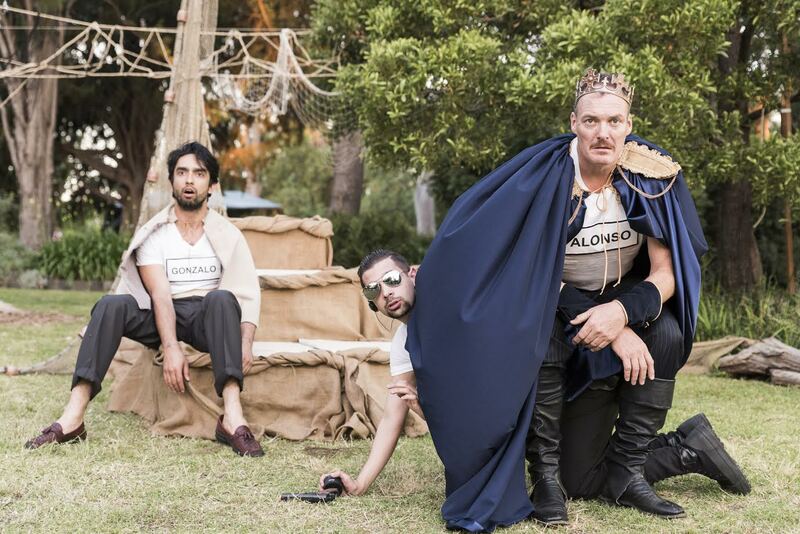 Khisraw Jones – Shukoor as Gonzalo, John Reed as Adrian and Hunter Perske as Alonso. By Burke Photography. Madeline Dunkley, Victoria Mantynen and Lara Vocisano as Ariel, Hunter Perske as Alonso, Charlie Sturegon as Ferdinand, Johnathan Peck as Trinculo, Jessica Tanner as Antonio, Andrew Illes as Sebastian and Paul Robertson as Boatswain. By Burke Photography.